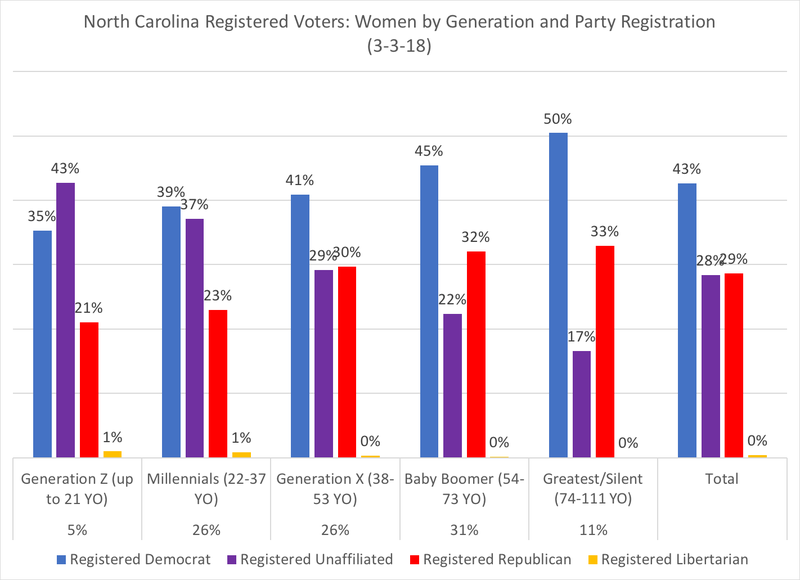 With discussions of how women may be a deciding factor in the 2018 mid-term elections, and in concluding Women's History Month, I decided to do another deep data dive, this time into the gender differences within North Carolina's registered voter pool. 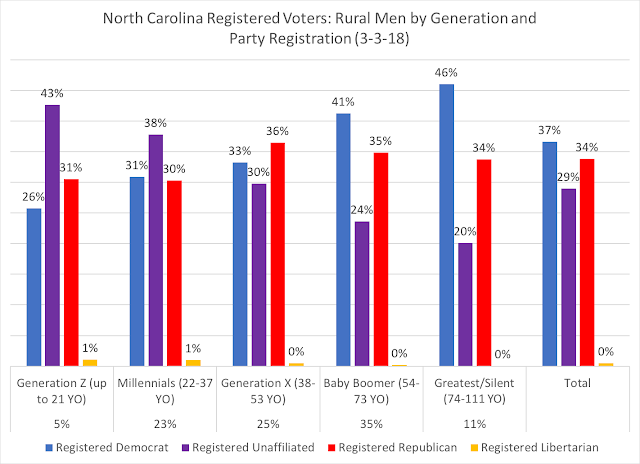 My research interests in the Old North State's politics tend to focus on how North Carolina's voter pool is experiencing two "tectonic" shifts: one based on generational cohorts (those voters under the age of 37, who constitute the Millennial and Generation Z cohorts, versus those voters over the age of 37, who make up Generation X, Baby Boomer, and Silent/Greatest generations), while the other shift is the urban/suburban/rural divide in the Old North State. 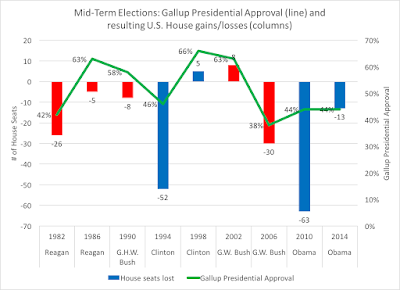 This analysis uses these two characteristics to divide the active and inactive registered voters, with a focus on gender. Overall, as of the March 3, 2018 data on the 6.8 million registered NC voters, women are 53 percent of the registered voters in the state, and typically are that same percentage when it comes to casting ballots in general elections. 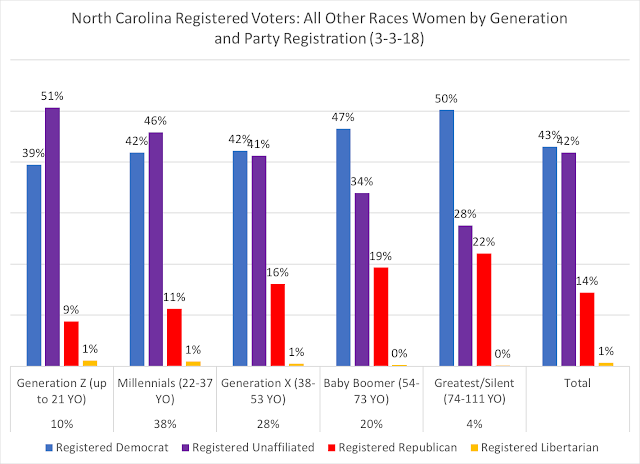 Among all female voters, a plurality (43 percent) are registered Democrats, with registered Republicans and unaffiliated voters neck-and-neck. This Democratic advantage among female voters is actually higher than the state-wide average of all voters, which breaks down at 39 percent Democratic, 32 percent unaffiliated, and 31 percent Republican. 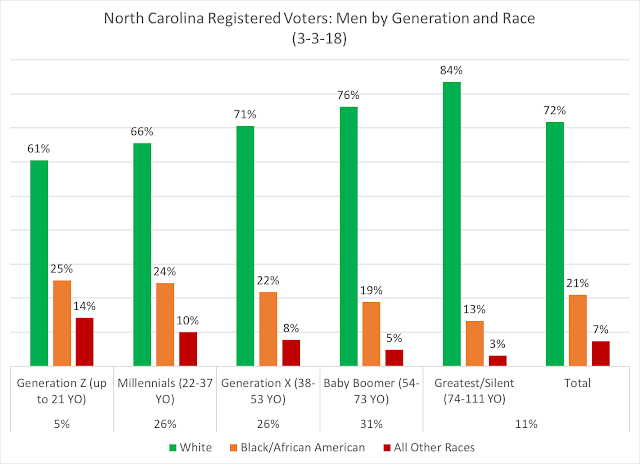 Generationally, 31 percent of female voters in North Carolina are under the age of 37 (26 percent are Millennials, with 5 percent Gen Z). When broken down into generation cohorts, however, a very noticeable trend occurs: going from older voters (Greatest/Silent) to younger voters (the emerging Gen Z cohort), partisan registration falls for both Democrats and Republicans, while unaffiliated status rises considerably from older to younger female voters. Barely twenty percent of the now youngest voters are registered with the GOP, while a little over a third of them are registering Democratic. When looking at female voters by race (white, black/African-American, and all other races), again, noticeable trends occur by generation. As is the demographic trends nation-wide, younger voters are becoming much more racially diverse, and this is reflected in the state's female voters: less than 60 percent of Gen Z registered female voters are white, with 32 percent being persons of color. In taking these racial categories and dividing them into their party registrations, you again see considerable changes from older to younger female voters in the state. 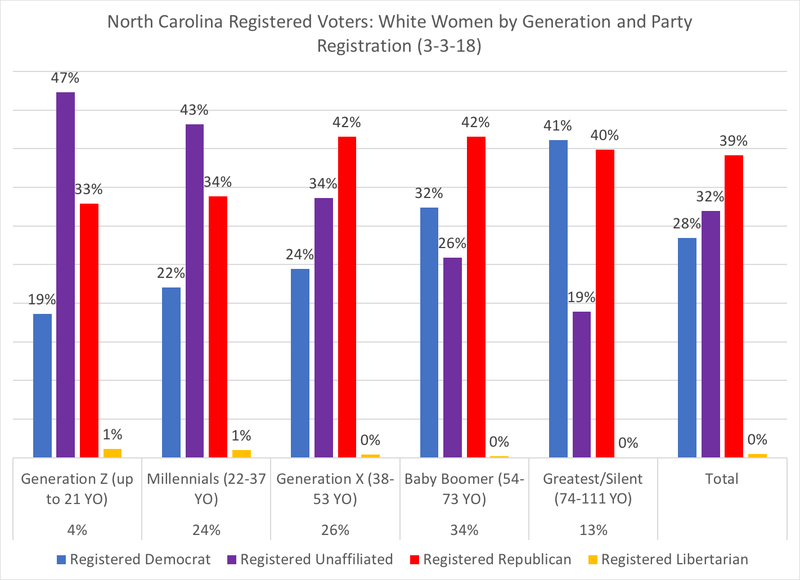 While older white female voters (Greatest/Silent) are nearly evenly split between party registrations, with not even twenty percent as unaffiliated, the decline of partisan registration among white females is distinct between the dividing line of Gen Z/Millennials and older voters. With 43 percent of Millennials registering as unaffiliated, and nearly half of Generation Z women going unaffiliated, the trends among white female voters are striking for both political parties. Democratic registration among younger voters has slipped below 20 percent, and barely a third of white females are registering with the GOP. 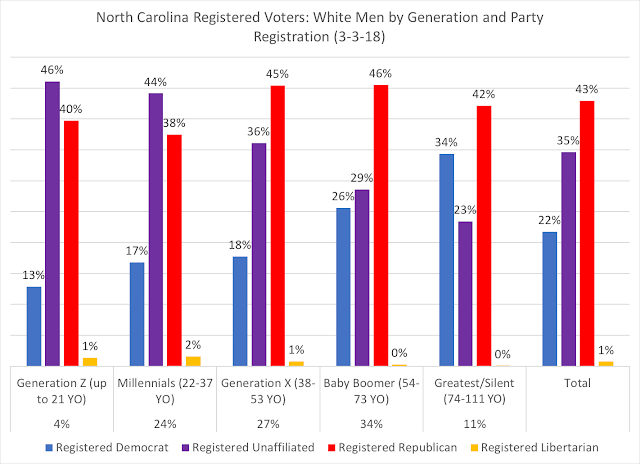 Generationally, an interesting trend is that white female voters are still more Baby Boomer than younger, compared to the state averages for the generational cohorts (34 percent Baby Boomer among white female voters compared to 31 percent state-wide, while 28 percent of white females belong to Gen Z/Millennials, compared to 32 percent state-wide). This rise of unaffiliated registration is not just limited to white female voters. 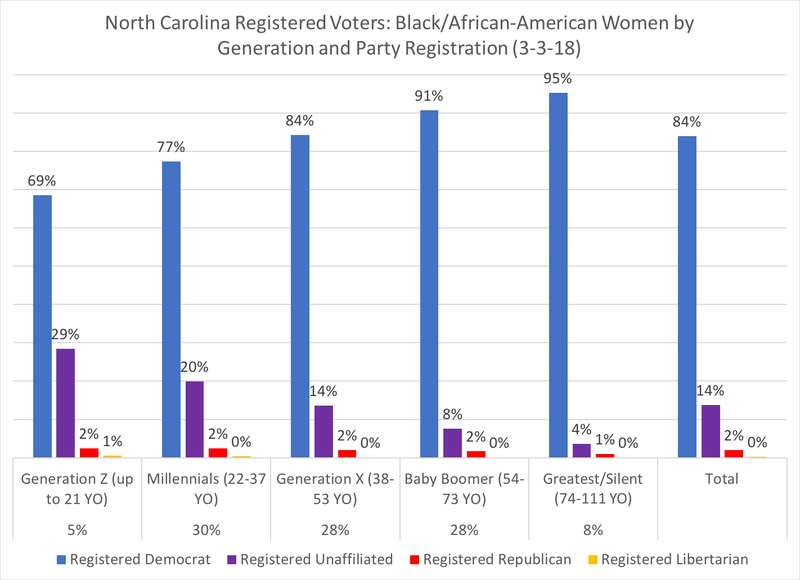 Among black/African-American female voters, the emergence of what seems like a post-civil rights/Democratic dominance when it comes to voter registration is well underway. 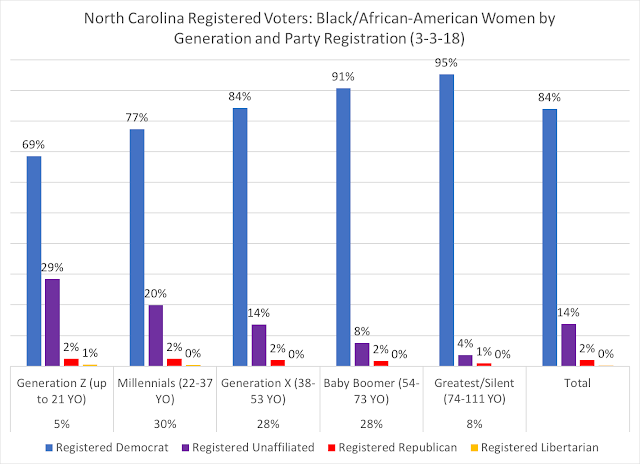 Unlike white females, however, 35 percent of black female voters are under the age of 37, a noticeable generational shift well underway within this group of voters. Nearly half of females of all other races are Generation Z or Millennials, with only twenty percent belong to the Baby Boomer generation. 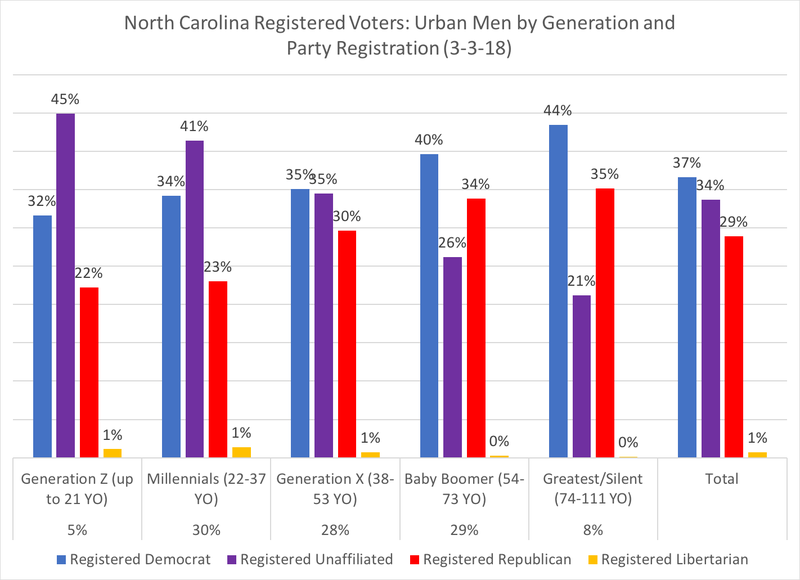 Most striking, in this group of voters and their party registration, is the demise of Republican affiliation: only 11 percent of Millennials and 9 percent of Generation Z voters registered with the GOP. Finally, taking the "regional" analysis, 54 percent of all NC female voters are in urban counties, with 22 percent in suburban counties, and 24 percent in rural counties. 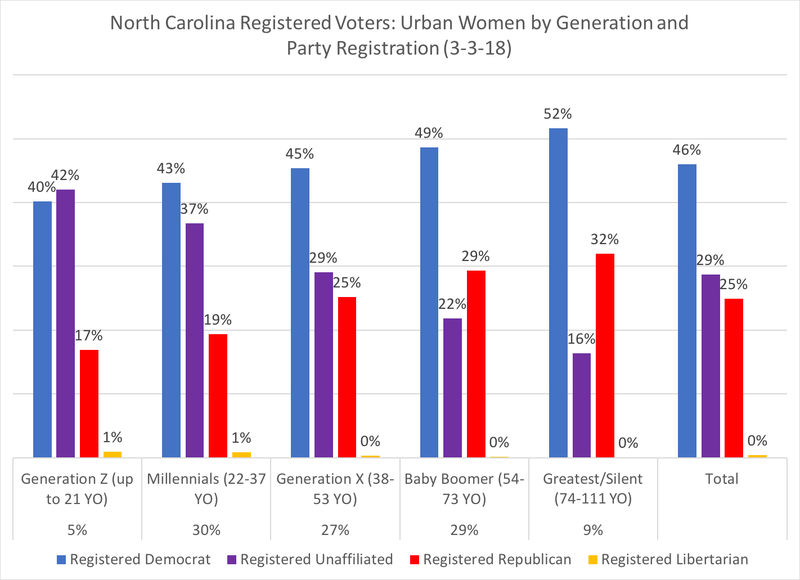 Among the urban female vote, it should not be surprising that Democrats dominate, given the gender gap allegiance and urban trend towards the Democratic Party. 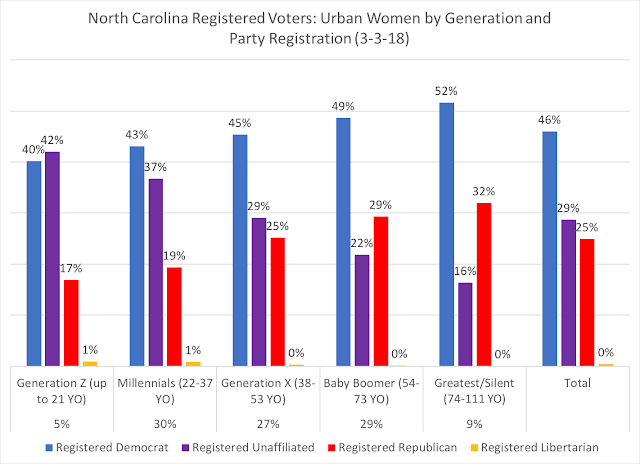 However, as is the case above, younger voters are splitting more and more between Democratic and unaffiliated registration, with Gen Z urban females slightly more unaffiliated than Democratic. 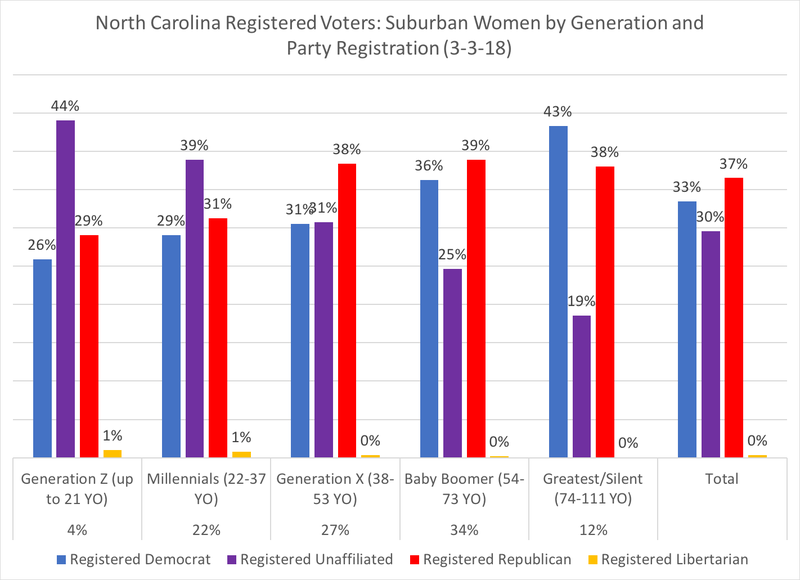 The considerable drop in female Republican registration in urban counties may mean that reliable Republican votes in urban counties will be fewer and fewer in upcoming elections. In all suburban NC counties, registered Republicans are a plurality among female voters, but as the voter is younger, the trend against both parties is quite distinct, with both Millennial and Generation Z suburban females showing 40 percent or greater registration as unaffiliated. 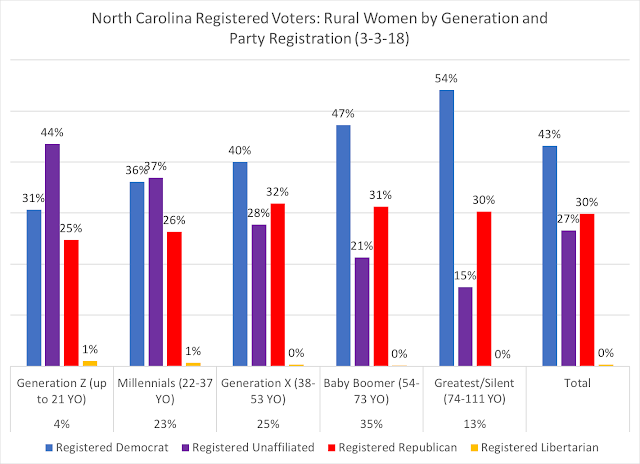 Finally, in looking at rural female voters, the influence of black females gives Democratic registration a plurality among all voters, but again, the trend towards unaffiliated among younger rural female voters is evident. 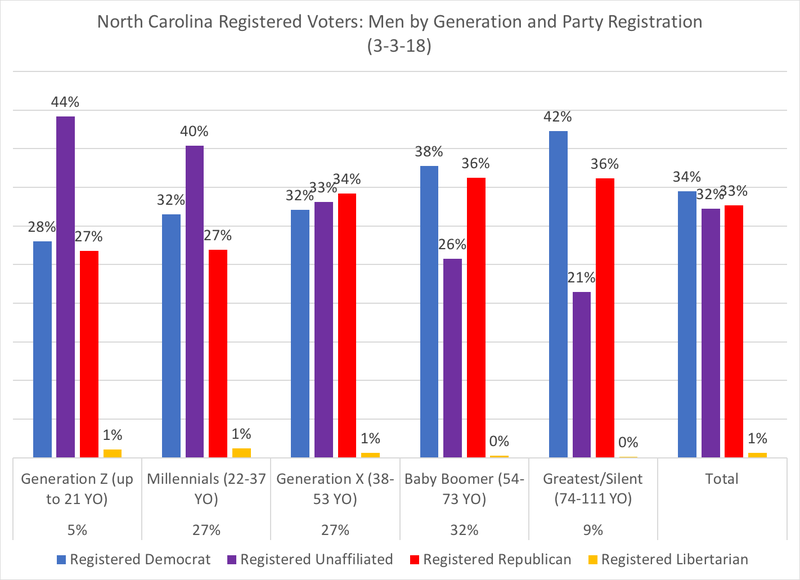 Like with NC's female voters, younger male voters are deciding not to affiliate with either of the two major parties, with unaffiliated registration nearing 45 percent of Gen Z males. 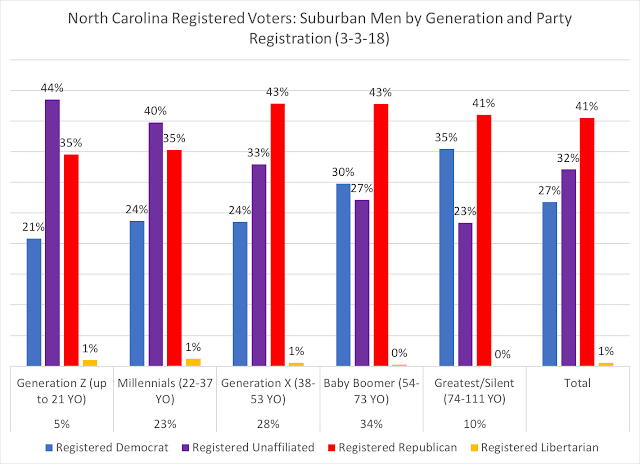 In the overall numbers, Generation X males appear to be the bridge between the partisan registration patterns of older voters and the plurality-unaffiliated registration patterns of younger voters. When looking at male voters by racial categories, those in the Generation Z cohort are slightly more white than their female counterparts. 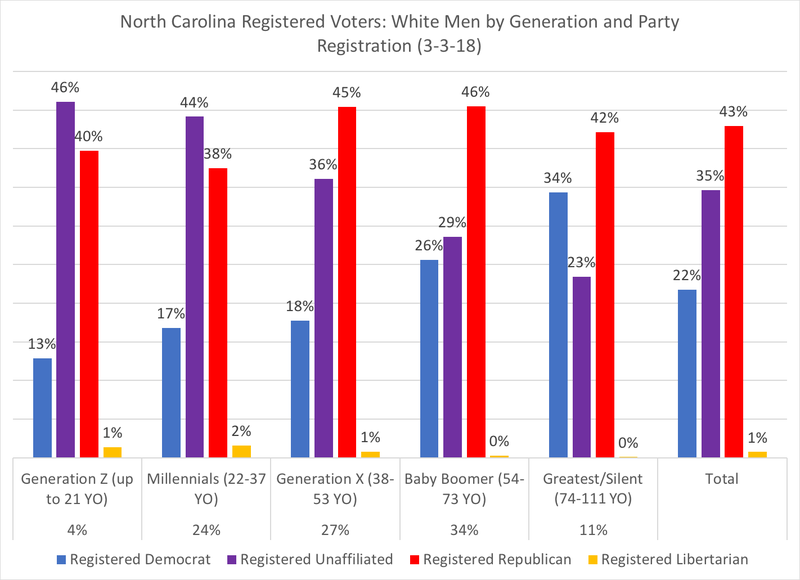 Not surprisingly, when it comes to white male voters in North Carolina, Republican registration does tend to dominate overall, but when voters hit the age of 37 and below, unaffiliated status becomes the plurality of registration. 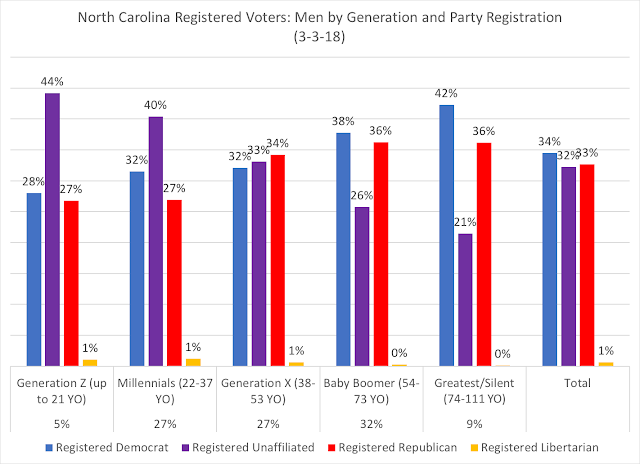 Democratic registration has slipped into the low teens among younger male voters, with a slight uptick from Millennial to Generation Z male voters registering with the GOP. Like black/African-American females, younger black male voters are moving away from Democratic registration towards now a third of Generation Z voters being unaffiliated. 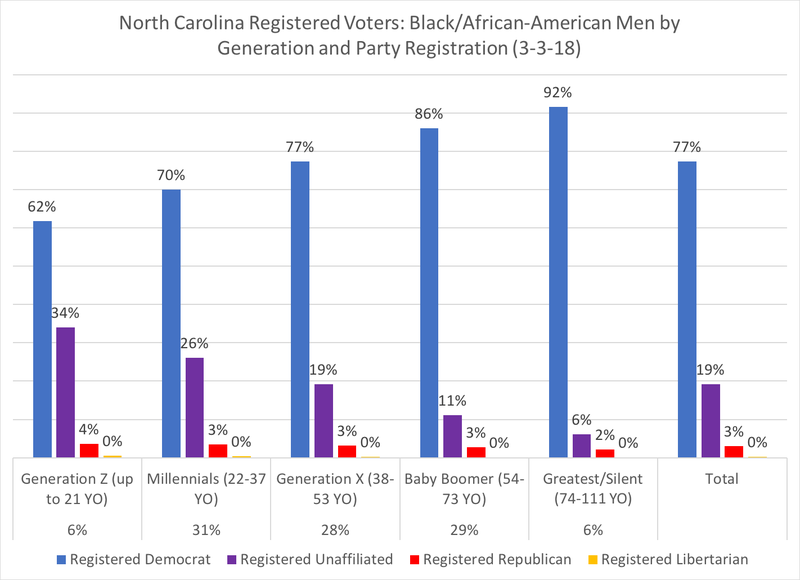 With three-quarters of all black men registered in North Carolina are registered Democratic, that percentage will continue to slip, as 37 percent of all black men are either Millennials or Generation Z. Among male voters who are all other races, the Republican dissipation is not as low as among females, but with only 13 percent of Gen Z male voters in these racial categories registering with the GOP, it may not be long before that number hits into single digits. Within urban counties, 35 percent of voters are under the age of 37, a noted trend among younger citizens to reside in urbanized areas of the nation and the state. 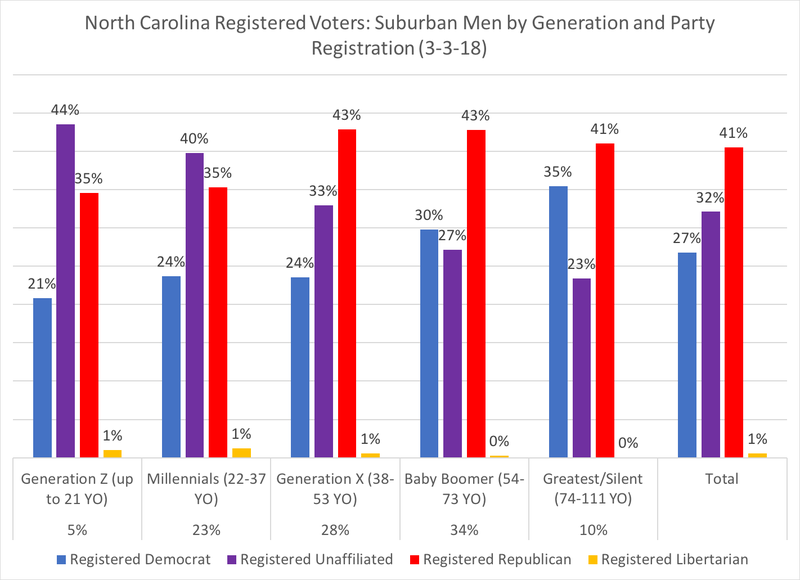 In suburban NC counties, male voters are slight more Baby Boomer and more Republican as a whole, but the fact that 40 percent of Millennial suburban men and 44 percent of Gen Z suburban men are unaffiliated seems to be coming at the cost of Democratic registration, while Republicans are holding steady at 35 percent in both generational cohorts in suburban NC. 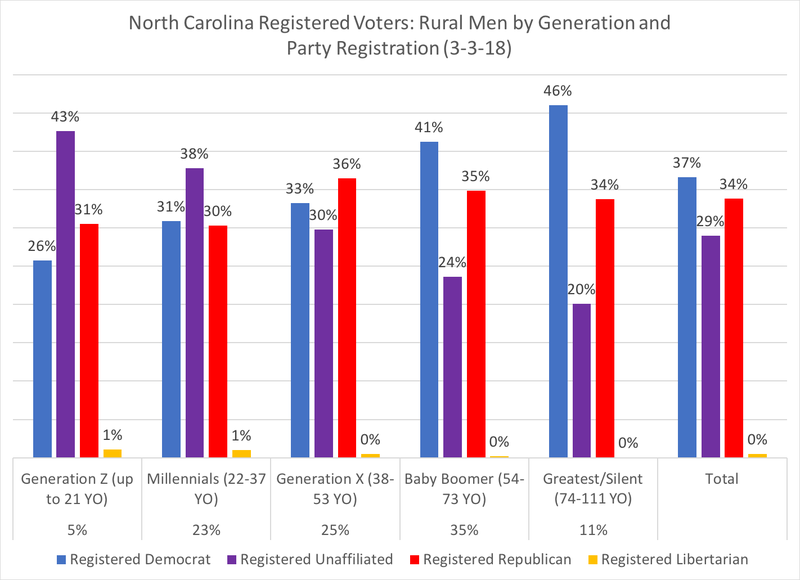 Finally, among rural registered male voters, Democrats slightly outnumber Republicans (37 to 34), but again, the unaffiliated rise in Millennial and Gen Z rural males is notable for the future. 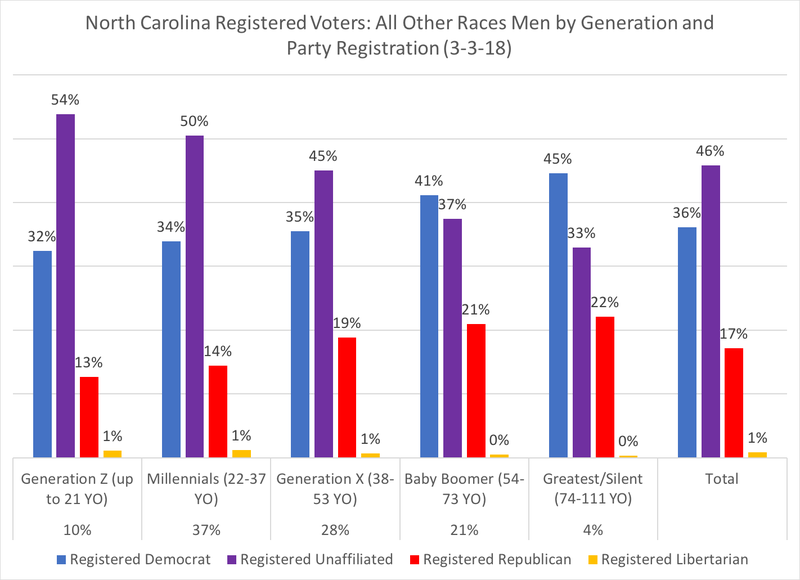 The overall take-aways from this gender analysis seem to point to the fact that the generational divide is most pronounced in voter registration, with the fault-line being 37 years old--between Millennials and Generation Z and older voters (Gen X, Baby Boomers, and Greatest/Silent generations). 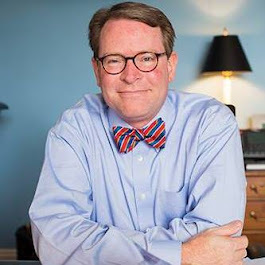 While this divide is pronounced in some racial and regional categories, the continuing trend of racial diversity within the eligible electorate will make it harder for political parties and their candidates to evenly count on voter support as more individuals move the "unaffiliated" registration. But this does not necessarily mean that these unaffiliated voters are "politically independent"; as shown in a previous post, based on national figures, younger voters are more Democratic in their voting allegiance. If indeed, both both younger and female voters make their presence known in this fall's election, the tectonic plates could continue to rub against each other and cause some seismic quakes at the ballot box this November.